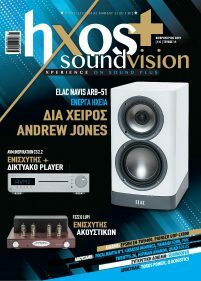 HXOS (SOUND VISION) is the best technology magazine in Greece. It covers every new development in the audio, video, music and new media sectors by analytical reviews of products and technical introductory articles of consumer electronics at large. The main topics are audio, television, home cinema, high-end, mobile devices and photo. Also, we have a lot of pages covering music, live concerts, interviews and software reviews. The magazine generates its own scientific tests based on a private laboratory which is fully equipped with modern measurement instruments. The stuff is a group of very well-known reviewers in Greece who are the soul of the magazine. Our motto is “our senses matter”. Sound Vision is a unique tool for every consumer or hobbyist who speaks the Greek language.